What is drain tile? When should it be used? Many contractors, land owners, and developers throw around the term drain tile. Although an effective solution in solving some drainage issues, the decision to install depends on the situation. Drain tile is a vague term. The term is generally used as any drainage system that transports water. Early systems were comprised of clay roofing tiles and built to aide in agriculture, hence the word “tile”. Farmers used and still use the systems to free the soil of excess water that could damage crops. One of the early pioneers of this system was Henry French, who wrote “Farm drainage: the principles, processes, and effects of draining land with stones, wood, plows, and open ditches, and especially with tiles.” His system was so widely used that it was termed “French Drain”. The method consists of piping systems, usually made up of perforated polyethylene buried in stone used to transport water with the aid of gravity. The pipe is then directed towards an opening in a drainage ditch or connected to a storm sewer system. Whether it is new construction or re-construction of a parking lot, drainage above and below the surface is a top priority. Drain tile can be used to help dry out or re-direct water infiltration to the sub base. The question then becomes, should drain tile be used on all parking lot construction? The answer is a little tricky. -A parking lot in a low lying area is the main candidate for drain tile installation. If a parking lot is surrounded by areas of higher elevation, e.g. a hill, the perimeter of the parking lot should be lined with drain tile so the natural ground water flow can be caught before entering the sub base of the parking lot. 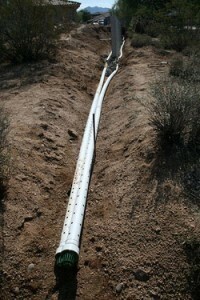 -Soil types are another reason drain tile should be used. If the sub base is made up of a clay mixture, it is likely to hold more moisture than a soil type with finer gradation. Drain tile may be placed in the swale (area of surface water flow) of a parking lot to help dry out the surrounding soils. -When water seepage is apparent, is another reason to install drain tile. If the surface of the asphalt, in a reconstruction project, displays moisture on a dry day, it likely that the sub base is saturated and needs to be dried out. -Minimizing undercuts is another reason to add drain tile. If it is known that the sub base is saturated, due to water seepage or geological data, it may be suggested to install drain tile and let it sit for a period of time. This would be done to help dry out a parking lot area where undercuts are suspected, thus minimizing costs. -Protecting an investment is another reason to install drain tile. If there is room in the budget, drain tile should be placed along the perimeter of a parking lot, especially under curb & gutter and along green space. This practice is an effective way to safeguard against future water infiltration to the sub base of the parking lot. In summary, drain tile should be considered as an option when constructing or reconstructing a parking lot. While each situation is different, an honest and candid conversation about its uses should be had. Photo credit: Thanks to ToddonFlickr for the great photo!